has become synonymous with Fine Crystal. In the year 2000, thirty thousand Americans were asked to rate nineteen world-class brands available in the United States. Included in their selection were such fine brand names as Rolls-Royce Bentley, National Geographic, and Bose. 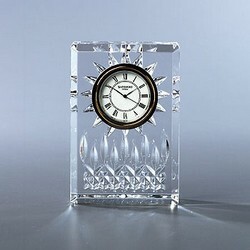 But the brand name that was rated at the top for quality was none other than Waterford Crystal. The beauty and durability are unmatched. But the loyalty collectors feel goes beyond that. The endurance and strength of the crystal is a reflection of the company's own history, which spans over two hundred years. The company survived seemingly insurmountable odds and continues to be, even in the twenty-first century, the finest crystal manufacturer in the world. The company's resilience is a testament to the Irish people who had a part in its survival. Indeed, the story of Waterford crystal is an inspiring metaphor for the history of Ireland itself. Originally known as "Penrose glass", Waterford crystal was first produced in the Waterford Glasshouse, founded by George and William Penrose in 1783 in Waterford City, Ireland. The two brothers were already world-class businessmen, and launched the development of the first Waterford crystal factory at a cost of £10,000, an enormous sum in the 18th century. In the beginning, the factory employed less than 100 employees. The creator of the orginal Waterford crystal designs was John Hill, a compounder from Stourbridge who brought with him "the best set of workmen to be found in the County of Worcestershire". 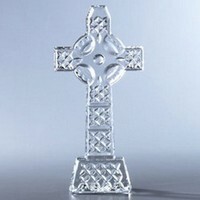 Together they crafted Irish crystal that was finer than any other in Ireland or England. Thanks to their fine craftsmanship, the city of Waterford soon became one of the busiest ports in Ireland, exporting crystal as far away as New York and the West Indies. Hill became close friends with the clerk of the Waterford crystal factory, Jonathan Gatchell. Before Hill left the factory, he taught Gatchell his secret techniques for making fine crystal. After Hill's departure, Gatchell became the lead compounder. Soon after William Penrose's death in 1796, the company was sold. But Gatchell remained as one of the new partners. Fourteen years later, Gatchell was the head of the company. Unfortunately, just as Gatchell took over, Ireland was hit with a new tax act, which imposed heavy excise duties and became a tremendous burden on the entire Irish glass industry. Nevertheless, Gatchell's persistence and leadership helped the company survive and even thrive until his death. The company was under Gatchell control once again twelve years later, when Jonathan Gatchell's son took over the helm. For sixteen years, the young Gatchell managed to keep his father's company alive as well. But the "Age of Irish Glass" was rapidly coming to an end. Since 1780, it had grown and flourished. But between 1825 and 1852, eight out of eleven of the glasshouses in Ireland financially collapsed. Although the heavy excise tax on glass was lifted in 1845, the damage to Waterford Glassworks was irreversible. Gatchell and Waterford held on to the end, but in 1851 he had no choice but to put the company up for sale. From the Penrose brothers, to John Hill, to Jonathan Gatchell and then his son...the chain linking Waterford crystal back to the Penrose's lasted for sixty-eight years despite seemingly insurmountable odds. The story of Waterford Crystal is a fitting metaphor for the story of Ireland itself. Thanks to the worldwide reputation Waterford crystal had earned, the company was revived in 1947 with a new factory built less than twelve miles from the one built by the Penrose brothers more than a century-and-a-half earlier. Today, the main Waterford crystal factory is on a forty-acre site and employs thousands. The company has two other plants in County Waterford as well. By far the most popular pattern is the classic Lismore, introduced over fifty years ago. 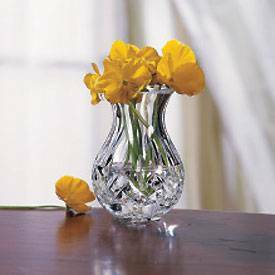 Waterford has sold more Lismore pieces than any other design. Waterford crystal has loyal collectors from all over the world that will settle for nothing less than the finest crystal in the world from the finest crystal manufacturer in the world. And as a show of their commitment to those collectors, Waterford is the only fine crystal manufacturer in the world that guarantees never to discontinue any of their crystal stemware patterns. In addition, they offer registered owners of their crystal stemware the "Waterford Consumer Confidence Program", which allows registered owners to replace any broken piece for only 50% of the current retail price. Although visiting Waterford City, Ireland and touring the factory is wonderful, I don't really recommend buying your Waterford crystal there. Why? Because although you may hear that prices are less when you buy direct from the factory, that isn't the case with Waterford crystal. In addition, fine purchases this delicate should be professionally packed, shipped, and insured. If you buy in Ireland, make sure to have it shipped to your home rather than bring it home yourself. Or, better yet, rather than buying it as a tourist... buy it online from a distinguished merchant who is part of the Waterford Wedgewood Company, like Cashs of Ireland. Each and every piece is a priceless Irish treasure.